Custom Wallpaper Inspiration: New Website Coming Soon! We're busily working on a new design for our main website, www.GreatWallOnline.com. We're streamlining our order process, and adding a bunch of new wall murals, including this goth-inspired wall mural we featured as an inspiration piece on our blog. We'll also be adding a brand new line of childrens wall murals. 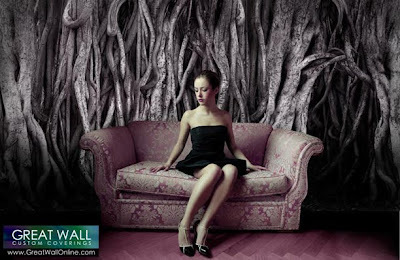 In addition to the new wall mural images, we'll still be offering our custom wallpaper services. Updates to follow! Where can I find this? I can't find it on the site anywhere. My friend is extremely interested in purchasing this mural.